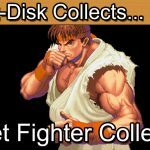 Insert Disk collects Street Fighter Zero for the Sega Saturn. Welcome to Part 3 of 11 of this Sega Saturn Capcom Fighting games mini series. We will be taking a look at all of the major Capcom fighting game releases from Street Fighter, Marvel, Street FighterVs and Darkstalker series. 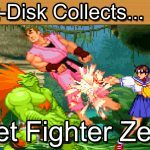 Part 3 sees the launch of the Street Fighter Zero Series on the Sega Saturn with Street Fighter Zero. Greetings collectors and welcome to today’s retro game review. 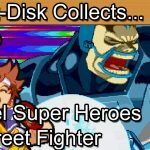 You join us in part 3 of the Sega Saturn Capcom Fighter Mini series. We’re taking a look back at Capcom’s fighting games for the Sega Saturn. Expect Street Fighter. Street Fighter Cross-overs. Marvel and Darkstaklers all battling it out on behalf of Capcom. In the last episode we saw how X-Men Children of the Atom had shown the Street Fighter series how fighting games should be done on the 32-bit consoles. Big, bold and beautiful, X-Men had thrown the gauntlet down to the Street Fighter team to create an even better experience. 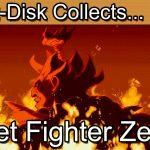 In early 1996 the Sega Saturn would receive Street Fighter Zero. Known as Street Fighter Alpha outside of Japan. Whilst not drastically different from previous Street Fighter 2 entries in the series there was definitely evolution here. The graphics have had an overhaul to a more appropriate 32-bit colour pallet. The animations now more fluid and original stages added. Perhaps one of the most noticeable elements are the new characters, Birdie, Adon, Guy, Sodom, Nash and Rose. The game only features 10 playable characters without using unlock codes so there’s a clear shift away from classic Street Fighter 2. From Street Fighter 2 only Ryu, Ken, Chun-Li remain with Sagat also now not considered a boss. Interestingly Guy and Sodom arrive from another Capcom masterpiece. Final Fight. Guy is one of the games heroes whilst Sodom is a level boss. This was an early sign that the Capcom universe was beginning to overlap and knit together as a single entity. More on this in a later episode. Of the new characters I find Rose perhaps the most interesting. Up until now the female fighters had all been quite stereotypical. Rose the fortune teller though starts to branch out the types of fighter represented in the series. So, how does it play. The answer, very well indeed. If you’re used to Street Fighter 2 than you’ll have no issues at all in transitioning to the Zero/Alpha series. The Sega Saturn edition is as always best played on to Sega HSS 104 control stick. I’ve mentioned it before but I can’t recommend it enough. If you have a 6 button arcade fighting game in front of you then this is perhaps the best option you will ever find. It’s solid and built with the arcade in mind. It really is a game changer and so important so that you can roll the semi-circles for faster hadukens and shurukens. 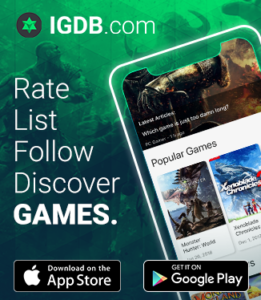 You’re really going to have fun with this game. It very much feel like classic Street Fighter 2 but with a modern flavour. The combo system in itself isn’t new to the series. However, the extent to which you can pull off manual and semi-automatic manual has been greatly refined. If you’re the type of player that plays the points game then there are bonus points available for ending on a super combo finish. It also looks rather impressive. In terms of a physical release Street Fighter Zero is a bit of a mixed bag. The back cover works well with the games fighters. The main cover though I’m not overly fond of. At least the Japanese edition. The Alpha editions just seem to capture the feel of the game a little better. On the Japanese cover Ryu looks the part but Ken looks far more feminine than he’s usually portrayed. The ponytail doesn’t help but generally he looks a bit different to normal. Nothing game breaking at all though and the cover is at least reasonably memorable. The manual makes up for this as we see Ken kicking Ryu and much more representative of the Ken we all know. Chin-Li makes the game disc and the overall presentation feels solid. The manual is really well put together with move sets for all of the characters and some very nice illustrations of the characters. It’s in the manual where you discover move sets for Vega and Gouki (known as Bison and Akuma outside of Japan). These characters are unlockable and become playable. There is also the character of Dan who is unlockable via code. 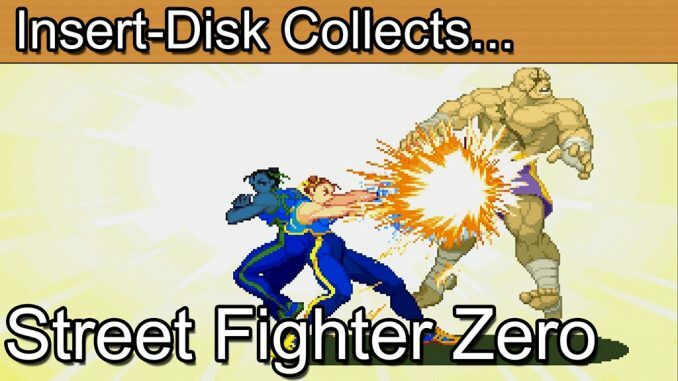 As a game Street Fighter Zero set a new bar for the series. It was one of the faster, more colourful entries to date and really nothing to complain about at all. Sure we had lost some of the classic Street Fighter 2 characters but we had gained some new ones in their place. The improved combo system, special moves, power bars and cross over characters all subtlety shifted Capcom’s fighting game offering to the fans. These weren’t dramatic changes but little did we know, Capcom were not only programming games but programming us in preparation for where they wanted to take their games in the future. With Zero landing in January 1996 it then came as a welcome surprise that Zero 2 would also be arriving in the same year on the Sega Saturn that September. Capcom were taking things very seriously and there was a real push to get people mind back on Street Fighter. Rival series such as SNK’s King Of Fighter’s series had become well established in the arcades and Sega Saturn by this point. Zero 2 needed to not just slowly evolve the series, it needed to innovate. Join me in the next episode to as we take a look at the rather excellent sequel. Street Fighter Zero 2.